In the magical underworld of Victorian London, Tessa Gray has at last found safety with the Shadowhunters. But that safety proves fleeting when rogue forces in the Clave plot to see her protector, Charlotte, replaced as head of the Institute. If Charlotte loses her position, Tessa will be out on the street—and easy prey for the mysterious Magister, who wants to use Tessa’s powers for his own dark ends. With the help of the handsome, self-destructive Will and the fiercely devoted Jem, Tessa discovers that the Magister’s war on the Shadowhunters is deeply personal. He blames them for a long-ago tragedy that shattered his life. To unravel the secrets of the past, the trio journeys from mist-shrouded Yorkshire to a manor house that holds untold horrors, from the slums of London to an enchanted ballroom where Tessa discovers that the truth of her parentage is more sinister than she had imagined. When they encounter a clockwork demon bearing a warning for Will, they realize that the Magister himself knows their every move—and that one of their own has betrayed them. I love Clockwork Prince way more than any of Cassandra Clare’s other books. It was an amazing read. I was hoping that I wasn’t going to be disappointed and I definitely wasn’t. I am a little at a loss as to where to start. Characters? Plot? Setting? Everything else? I am very thankful that Cassandra Clare did not provide us with another filler book, because Clockwork Prince is definitely not a filler book. I could be a good that is all by itself however, it provides a nice development to the characters and plot. Cassandra once again does an excellent job, I could feel what the characters felt, I felt close to them, I felt like I was there the entire time. Cassandra Clare’s best work yet. Charlotte: Charlotte is being held responsible for how she handle the Magister situation. She is given two weeks to catch Mortmain (Magister) or she will lose her position as the head of the London Institute. The whole gang wants to help her; they don’t want to see Charlotte lose the institute. She is like a mom to all of them. Tessa, Jem, Will, Sophie, they all love her, the last thing they want is to see Charlotte hurt or to watch something that she love’s be taken away from her. Charlotte is strong and not willing to give up easily. She isn’t going to let the Lightwoods push her around. Henry: Henry makes me laugh. 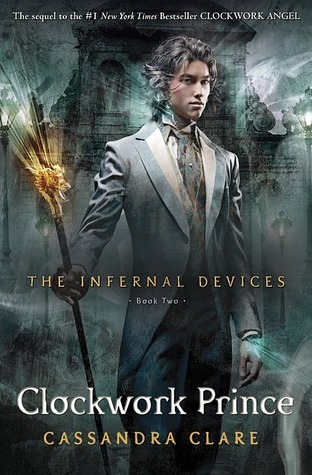 It is amazing knowing that he is going to create some great inventions that are used in the Mortal Instruments series. I love how things ended with Henry and Charlotte. They finally worked things out and let go of the past. Tessa: She is an amazing heroine. She doesn’t back down and she always puts on a brave face, no matter what her circumstances may be. Tessa is my kind of girl. I love how confident she is and how she wants to uncover the secrets of her past, she wants to know who she is. I just wish that her identity was revealed but unfortunately it is still a mystery. Tessa is part of the most complicated Triangle ever. You thought Jacob, Edward and Bella was complicated, well you haven’t even seen or read complicated until you meet Tessa, Jem, and Will. I have to give Cassandra props, out of all of the love triangle stories I have read, I think Cassandra Clare is doing a great. She is making a love triangle just like it should be love with impossible choices, which have to be made. Will: The beautiful blue eyed boy. I am trying my hardest not to choose sides between Will and Jem. I love them both. There are things about Will that I love and think would be perfect for Tessa but I can say the exact same about Jem. My heart breaks for Will because of how his misery consumes him. He pushes everyone away afraid that they might love him. Will is selfish, tough, quick minded, and mean but he is a great guy, he loves everyone even if he doesn’t show it. He is devoted to helping Jem because he wants the best for him. I love the friendship that Will and Jem have, they are the perfect balance to each other and it is one of my favorite things about this series. Jem: Jem is such a great character. He has such goodness that I wish people in real life had. Jem is portrayed so well in this book, but as each chapter went on the layers of his life and dreams were revealed. He knows that he is dying, but he doesn’t give up on his dreams and I admire him for that. Jem is such a sweetheart but he is still like every normal person out there, he has insecurities, anger, moments of depression, yet he is lovely, and honest. Jem surprised me in this book and I don’t want to spoil anything, so I just want to say that it was a good surprise. Sophie: I still haven’t decided if I like Sophie. There are times that I think she is great and others that I think she is being petty and selfish. Sophie is a pretty loyal servant to Charlotte and I don’t think that she would ever betray the institute because she loves it there, but there is just something about her that I really don’t like. The plot was amazing. I couldn’t put this book down. Cassandra had me on edge; I wanted to know what happens next. 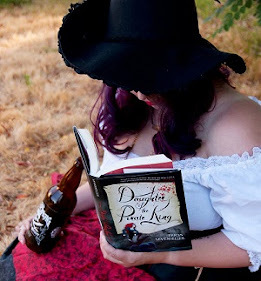 It is rare that I love a plot so much that I am extremely sad when the book ends, but I was sad when Clockwork Prince ended, because I wanted the journey to continue. I am looking forward to reading Clockwork Princess and I don’t know how I am going to be patient enough for March 2013 to roll around but I guess I will have to live. Cassandra Clare is a master at creating characters. She makes all of her main characters lovable but flawed, so they seem so real. I love the parabatai relationship between Will and Jem. They have a very touching bond that is stronger than anything. They may not be biological brothers but they have a bond that is stronger than just brothers. I relationship between Will and Jem is definitely the best relationship in both the Infernal Devices and the Mortal Instruments. Thank you Cassandra for such a great read.